It will be a mad geneticist sandbox game, for Android and probably iOS too. That's a cool and unique idea, is there gameplay beyond making the animals? And how are do you handle making the different combinations? When talking to a former friend I had the idea of a management game aspect, where you would try to create animals conforming to certain requirements, in order to get research grants so you could buy more animals and equipment. But I think that idea will not make it into the first version, for various reasons. Animal creation is completely general: animals are in a format that forms the DNA of them, so to speak. The computer then creates the sprites for their DNA on the spot. That means that all cross-breeds are "fertile" too, so you can cross-breed your cross-breeds -- infinite possibilites! * Spent the rest of the day rewriting large parts of the hybridisation code in order to make the result of far-fetched cross-breeds more reasonable. The code is currently runnable again but it is buggy and thus yields even worse abominations than before... As seen below. I will have to debug tomorrow, although the dentist will pull a tooth so I don't know how much I will get done after that. The goal is not to rule out mishaps altogether, such as the extra eye on that Fisrtorse, but I want there to be a way to get fairly normal abnormal creatures, and then if you want, you could get more weird mutations by increasing the radiation level (slider in middle of picture, not implemented yet). Still working on the new cross-breeding code. Found some more bugs in the sprite drawing code while defining the animal you see below. Base animal of the day: Ant. Now the cross-breeding code is rewritten again and yields somewhat interesting results but needs fleshing out, maybe tonight. Also, some z-index sorting issues can be seen in picture below. Thank you, I need it! There seems to be a certain fascination with hybrids in parts of culture (I hope), your Frankenstein game being another cool example! Today I just did a small bug fix, which seems to have created another bug unfortunately. No cool pictures, sorry. Slow progress today. But I made a pig (it needs some improvement though). Base animal of the day: Pig. The cross-breeding code is where I want it for the moment. It doesn't always yield likeable results, so you have to try a couple of times to get feasible animals. But that is almost good for the tempo of the game. Now I'll just have to fix the z-index issues and then I'll move on to adding planned features of the animal format that will allow me to represent more types of animals. Base animal of the day: Rhinoceros. Also, a Horsig. I might have fixed the z-index thing now. The Rhinoceorse symbolizes endurance in the face of bugs. Slow progress the last few days. I think one of the biggest challenges for this game is making the animals visually appealing enough, given that many gamers are somewhat spoiled with good graphics these days. The thing is that the game's base animals aren't really drawn by hand by an artist, but rather defined in a data format that comes with certain limitations. And I have even less control over the animals that are produced on the fly during the course of the game. So far I have done a few things to improve on the visual character of the animals. I have made it so that the animals have a cartoony contour, and they can blink their eyes and open and close their mouths. The systems for this have been defined in a very general way, so any body part can have functionality comparable to eye lids or mouths -- possibly this could be used for other purposes somewhere down the road. I am about to add a few more visual features to the animal format: coverage such as scales or feathers, fur textures (don't know how well that will work out though), and a very flexible decoration pattern system. I hope those features will improve the eye candy factor somewhat. 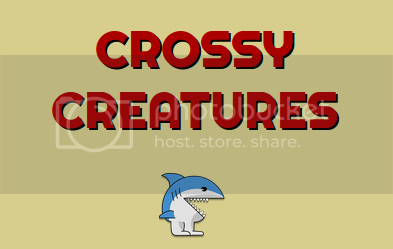 Hybrid Hybris is now Crossy Creatures. Just thought I would post an update. This project has been lying dormant for the past few months, but I do plan to take up development again this summer. I shall finish it! Finally started working on this again! I did a little change to the animal format which turned out to be rather complex to implement. And then I rewrote the cross-breeding code once again. It had become quite convoluted, which might have been part of the reason why I felt I needed a break. 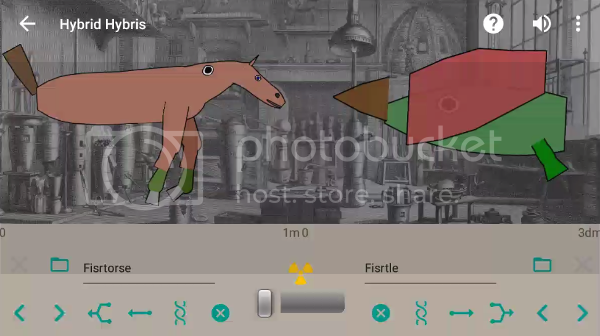 It is currently still a bit buggy (the horse's neck got duplicated for some reasons and added to the hind legs in picture below), will debug it tomorrow, but I think it will be both simpler and better once the bugs have been gotten rid of. You can still see some z-index problems on the forelegs of the rhinocerorse below, but I think I will just have to change a minus sign somewhere, the correct structure should be there. This is a really unique and creative idea - I think it could actually do really well if you give it the required time and polish you'd need to make it a viable product. As you explained before, I'm sure it's difficult to "polish" everything, when you really have no direct control over the final results of the crosses - but I think the "cartoony" look is definitely the right approach, as it will allow you more room for error, since even a weirdly "defective" animal could end up being cute and interesting. Will there be any other features other than just randomly generating the animals? Like a place to keep them or interact with them? This is a really unique and creative idea - I think it could actually do really well if you give it the required time and polish you'd need to make it a viable product. You think so? I hope! I guess the main target group is children. As you explained before, I'm sure it's difficult to "polish" everything, when you really have no direct control over the final results of the crosses - but I think the "cartoony" look is definitely the right approach, as it will allow you more room for error, since even a weirdly "defective" animal could end up being cute and interesting. The main plan for other features that I had so far was for a game mode where you would play as the mad geneticist. In this mode, you would breed towards certain goals (such as, for example: "Create an animal with four eyes, brown skin, and wings!"). Reaching these goals would give you research grant money, which you could then invest in new base animals for more genetic material to work with, or in new equipment for your lab which would allow you to manipulate the animals in more flexible ways. This way, I would be able to introduce the various features of the game (such as cross-breeding, cloning, radiation and gene insertion) gradually to the player, and it would also probably keep the player occupied with the game for a longer time, diminishing the risk that he/she get tired of the whole thing too quickly. The main problem with this "management mode" idea is that the current animal format is so general that it is hard to even formulate the goals for breeding: that is, "eyes" aren't really eyes, for example, but just general body parts, so if the player did breed an animal that looked like it had four eyes, there would be no certain way for the game to detect this easily, as the "eyes" might not be marked as "eyes" specifically in the code. Also, I'm trying not to be too ambitious to begin with, before I know what reception the game will get. So for the initial demo/beta, there will probably just be animal creation, hopefully in a way that does not feel wholly "random" to the player -- he/she will still preferably be breeding towards specific goals, only that those goals will have to be up to him/her completely. Also, several bugs were fixed, among them another body part reduplication bug. Scales! This feature will also be used for feathers and similar. I'm about to add fur functionality. It's not done yet, but in order to have something to test the fur on, I made a squirrel. He should be blinking too, but eyelids seem to only be working sometimes currently.